Google offered another preview of the upcoming Chrome OS Tuesday in a media event in San Fransisco, introducing a fourth option for operating systems – after Windows, Mac, and Linux – while opening the doors to the new Google Chrome Web Store. An open-source, lightweight operating system, Google Chrome OS leverages the Internet by delivering a speedy operating system in which all applications are Web applications (instead of hard drive-based). It is scheduled for release in the middle of 2011. 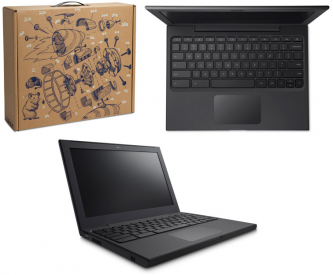 An exclusive (and unbranded) Chrome test notebook – the Cr-48 – was also released for participants of the Chrome OS pilot program. Built and optimized for the Web, the Cr-48 boots in ten seconds and resumes from Sleep Mode instantly. The 3.8 lb. notebook also comes with built-in Wi-Fi and 3G connectivity, flash storage, a webcam, a 12-inch LCD screen, a full-sized keyboard, an oversized touchpad, and a battery life of more than 8 hours (with about a week of standby time). While the Cr-48 might never go on sale, retail Chrome OS models by Acer and Samsung are scheduled for release next year.